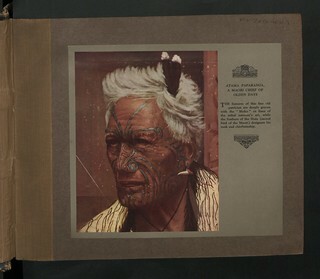 Description: Atama Paparanga, A Maori Chief of olden days. The features of this fine old patrician are deeply graven with the "Moko" or lines of the tribal tattooer's art, while the feathers of the Huia (sacred bird of the Maori) designated his rank and chieftainship. Our Catalogue Reference: Part of CO 1069/639.